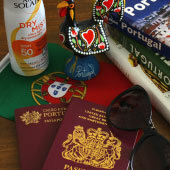 Cascais Weather, When To Go and Visit? Cascais is a great holiday destination that offers stunning beaches, wonderful day trips and a vibrant nightlife. 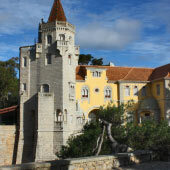 Cascais boasts a fantastic climate that is suitable for tourists to visit from early spring through to late autumn. This guide will detail the typical weather for each season and provide suggested activities for the entire year. 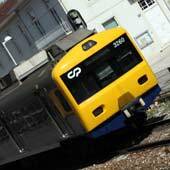 When best to visit Cascais? Cascais is blessed with amazing weather for three quarters of the year, starting in early spring and extending well into late autumn. 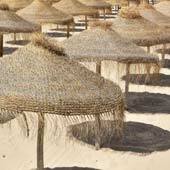 The temperature is suitable for spending time on the beach lasts from May to until mid-September. The early spring and late autumn are ideal for exploring the region and more suited for active holidays. 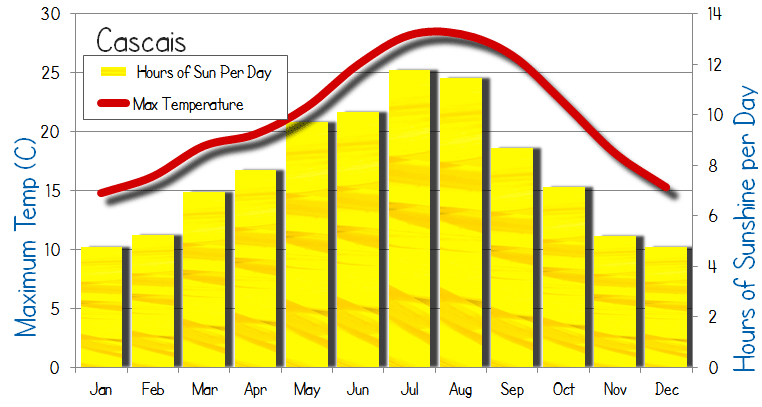 The height of the summer (June-August) ushers in hot, dry weather with an intense sun. 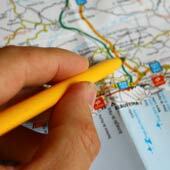 This season can be very draining for exploring, sightseeing or for young children. The close proximity of Cascais to the Atlantic Ocean does mean that there is often a cooling breeze at night and the area does not experience the extremes as other Mediterranean countries. The winter months can be unpredictable with an equal amount of bright clear days as gray wet days. Generally the weather is too cold for spending time on the beach but there can be amazing bargains in the winter. The recommended time to visit Cascais is during the spring or early summer months before the height of the tourist season. This is a great time of year to visit Cascais as the holiday can combine time on the beaches and time exploring Sintra and Lisbon. The weather is suitable for lounging on the beach between May through to late September with the months of July and August be classed as very hot. Lisbon residents spill out of the capital during August as businesses and schools shut down for a month long holiday and the beaches of Cascais can get crowded during this period. 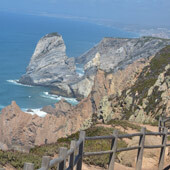 If your holiday plans centres around getting a great sun tan and the maximum day time temperature is no issue head to Cascais between mid June to the end of August. The sun is very intense at this time of year and small children and fair people will burn very quickly. 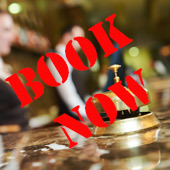 At the height of season hotels and resorts are filled with package holiday tourists and accommodation should be booked well in advance. Even at the height of the summer the sea water temperature is shockingly cold. For a balanced holiday which involves an equal amount of time on the beaches and an another activity - exploring the region or playing golf aim for either side of the height of the summer season. Outside of the height of season prices for accommodation drops and there are more options available. Late spring provides some wonderful weather and is personally my favourite time of year to visit the Cascais coast. 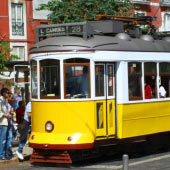 The carnival season is in mid June and Lisbon (only 20 minutes train ride away) has a festival atmosphere with traditional street dancing and great natured partying. Golf holiday visitors should avoid the height of summer as it is just too hot to enjoy playing a round of golf on the regions great courses, consider early spring or autumn. A little more risky option are the winter months, there could be rain but most days are dry and mild. The courses in the winter are almost empty with off season reductions during the week. It is always more pleasurable to play in Cascais during the winter than in Scotland! March and October are months more designed for exploring with less focus on the beach but the closer to mid Christmas the more unpredictable the weather becomes. 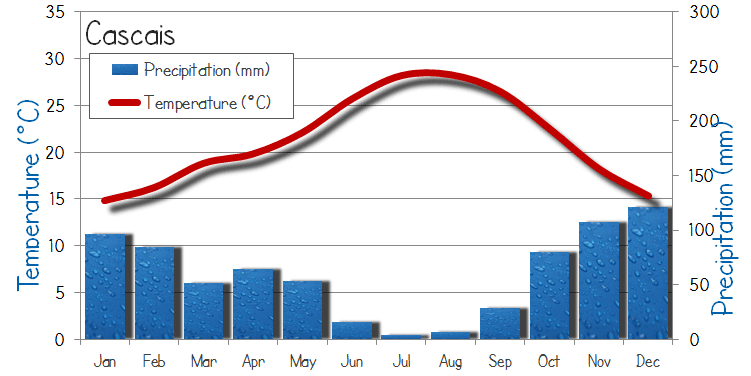 The winter months are mild with a fifth of days experiencing some rain, usually only a short shower. The winter months are for the sports enthusiasts. For surfers the wind direction alters and blows off-shore and whips up massive surfing waves great for experienced surfers. These conditions are also great for wind surfers and kite surfers. 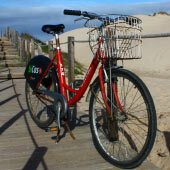 The sea temperature drops to 17C in the winter months, head to the beach of Guincho for the best waves. For most other visitors the winter is not an ideal time to visit the region. Cascais in winter can have rain and it can be cold but Lisbon is close by so there are always plenty of things going on.